A tour of the sizzling kebabs and piquant chutneys of Afghan cuisine. 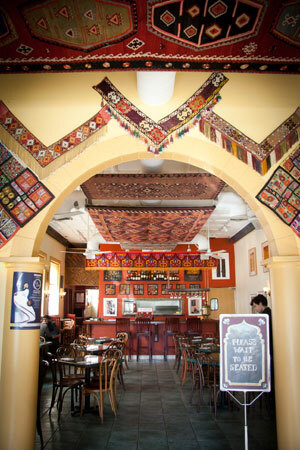 Afghani Cuisine reflects a unique mix of peoples and cultures. It is a rich and diverse cuisine, which includes influences from Indian, Persian, Turkish, Middle Eastern, Greek, Chinese and Central Asian cuisines. The blend of spices varies from family to family. Most dishes are flavorful but not hot. Generally, the hot spices are not added to the pot. Fresh or dried hot peppers, hot chutneys or spicy pickles are served on the side for those who prefer their food hot. Chutneys are relish-like condiments made of fruits & vegetables, ranging from sweet to very hot. Tea is an important part of Afghan culture. People drink tea throughout the day. Tea is the first thing guests are offered, and all meals end with a hot cup of tea.